Is Swordfish Healthy or Bad for You to Eat? In a few countries, swordfish is also known as broadbills due to its long flat bill. The fish is elongated and has scales only when young. Swordfish is an oily fish. The FDA warns against the high levels of mercury in the fish. So, is swordfish healthy?Yes, swordfish is nutritious and contains good amounts of omega-3 fatty acids, selenium, and other nutrients. Read on to know the health benefits and nutritional content of swordfish. Is swordfish good for you and is swordfish healthy to eat? 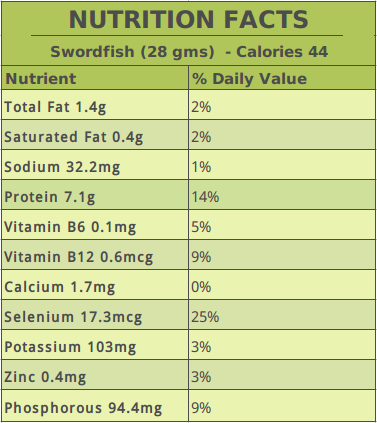 You can decide that after you read the health benefits of swordfish. Swordfish has a high content of magnesium which helps reduce sleep disorders. Magnesium has a soothing effect on our muscles and thus helps us get a sound sleep. It helps to enhance the duration and quality of sleep. Swordfish contains B-vitamin complex such as vitamin B3, B6, B9, and B12. Vitamin B12 helps in blood formation and DNA synthesis. It also helps in energy production and formation of myelin, a fatty substance that forms a coating around the brain cells. It also contains niacin, which increases the levels of good cholesterol and reduces the risk of cardiovascular diseases. Is swordfish high in omega-3 fatty acids? Yes, swordfish contains high amounts of omega-3 fatty acids and a good ratio with that of omega-6, which helps reduce inflammation and high blood pressure. A regulated blood pressure lowers the strain on the cardiovascular system and boosts heart health. This reduces the risk of stroke, heart attack, and atherosclerosis. Swordfish also contains good amounts of omega-3 fatty acids such as eicosapentaenoic acid (EPA) and docosahexaenoic acid (DHA). According to the Department of Health and Human Services, having eight ounces of seafood per week reduces the risk of death due to cardiac diseases. Swordfish is an excellent source of protein. It contains sufficient amounts of all the essential amino acids which help maintain an active metabolism. A three-ounce serving of swordfish contains 20 grams of proteins. Protein is required for the maintenance of healthy tissues such as skin, hair, and muscles. The body uses proteins to produce enzymes and transport oxygen. A serving size of 106 grams of swordfish provides 93% of the daily recommended intake of selenium. Selenium helps improve the bone health and also strengthens teeth, hair, and nails. It is an important antioxidant that helps with the proper functioning of the thyroid gland. Swordfish is a delicious low-calorie food as it does not contain carbs and has good fats. The amount of saturated fat in this fish is also quite low, and so is the amount of cholesterol. A one-ounce serving of swordfish contains only 44 calories. It contains 1.7 milligrams of calcium and seven grams of proteins. The potassium content in one ounce of swordfish is 104 milligrams. A three ounce serving of the fish provides 50% of the recommended intake of niacin, 16% of vitamin B6, and 12% of vitamin B12. The same serving also provides 9% phosphorus, which helps maintain healthy bones and teeth. It also helps in the formation of cell membranes and genetic material. The selenium content in one-ounce of swordfish is 17.3 micrograms which is 25% of the RDA. Can Selenium Counter the Ill Effects of Mercury? There is a lot of debate about the amount of mercury against so many nutrients in the fish, including selenium. Some research suggests that selenium could counter the ill effects mercury has on our body. Selenide, which is a selenium compound binds with mercury to form mercury selenide. Our body requires selenium in trace amounts, and the mineral is an important part of the 30 essential selenoproteins required by our thyroid gland, nervous system, and so on. However, with the presence of mercury that accumulates in our body, higher amounts of selenium are required to counter it. The fish possibly has a high amount of selenium to counter the accumulation of mercury. However, this does not mean that you can consume swordfish in large amounts; it just implies that it is safe to eat. Here are two healthy swordfish recipes you can try out at home. To make the marinade, add the orange juice, onion, thyme, basil, soy sauce, lemon juice, olive oil, and garlic to a bowl. Stir well and add salt, pepper, and sugar as per taste. Pour the marinade into a zip-top plastic bag and add the swordfish steaks. Seal the bag and shake it until the marinade coats the fish. Refrigerate the fish for about two hours. Prepare the grill. Remove the steaks from the marinade. Pour the marinade in a sauce and bring it to a boil. Spray the grill rack with cooking spray. Place the grill over medium-hot coals. Put the swordfish steaks on the grill rack and cook covered for three to four minutes on each side. Baste them with the marinade occasionally. Garnish with fresh basil sprigs and serve hot. Prepare the grill. Mix olive oil, basil, garlic, mint, lemon juice. Season the mixture with salt and pepper. Brush the fish with two tablespoons of the mixture. Grill the steaks for three minutes or until just cooked. Remove the steaks on a plate and spoon the remaining sauce over it. Serve hot. Swordfish contains high amounts of mercury, so pregnant women and children should not consume the fish. Mercury can damage the nervous system of the fetus. Healthy individuals should also monitor their swordfish intake and not consume more than one serving per month. 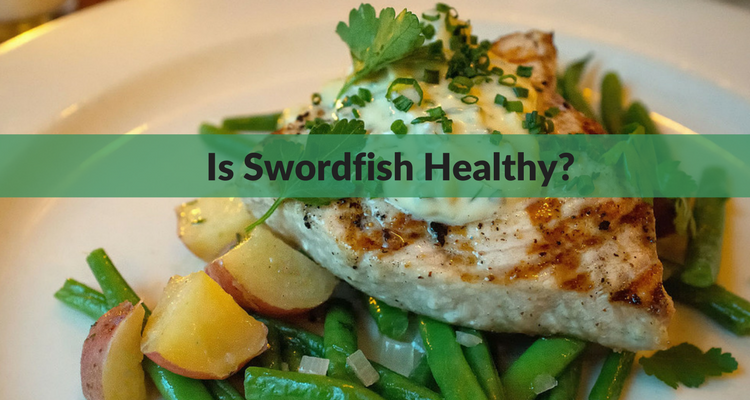 So, is swordfish healthy? Yes, as long as you consume only the recommended quantity. Ralston, N. V., and Raymond, L. J., “Dietary selenium’s protective effects against methylmercury toxicity.” Toxicity, November 28, 2010, 278(1):112-23. doi: 10.1016/j.tox.2010.06.004. “What Are The Health Benefits Of Swordfish?” DoveMed, November 17, 2016; http://www.dovemed.com/healthy-living/wellness-center/what-are-health-benefits-swordfish/. “Herb-Grilled Swordfish,” My Recipes, January 2001; http://www.myrecipes.com/recipe/herb-grilled-swordfish, last accessed June 12, 2017. “Selenium protects against mercury – provided you get enough,” Health and Science; http://healthandscience.eu/index.php?option=com_content&view=article&id=770:selenium-protects-against-mercury-provided-you-get-enough-us&catid=20&Itemid=374&lang=us, last accessed June 13, 2017. “Fish, swordfish, cooked, dry heat,” SELF NutritionData; http://nutritiondata.self.com/facts/finfish-and-shellfish-products/4137/2, last accessed June 13, 2017.